Spring, oh spring, where are you? Yes, I live in Seattle, and yes, it's supposed to rain. BUT... there have been only three sunny, mild days since the start of October. We've had more than 37.5 inches of rain in the last five months - and our average ANNUAL rainfall is 37.49 inches. Which means it could stop raining until September and we'd still meet the average. And, we had more snow in January and February than Minneapolis. Sigh. I'm so over it. I have two options: move to Arizona, or go shopping for spring clothes to take my mind off the gray gloom. I'll never get my husband to the desert, so shopping it is! After three months, my ban is officially over. The kid is still in college though, so I won't be going crazy. My very favorite spring trend, carried over from last year, is florals. So pretty, so feminine, and so spring-y. I'm also loving bomber jackets, because they totally bring me back to the 80's and my super special high school style. 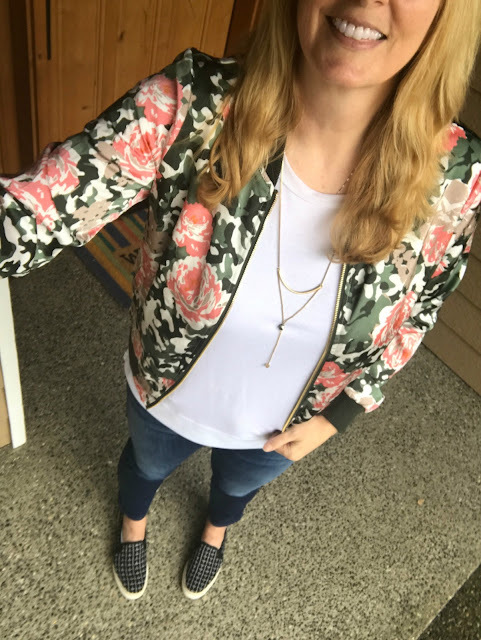 Clearly, this floral bomber jacket was meant to be mine. It even has my signature high school colors - dusty rose and sage green. It's lightweight and silky and fun. Now it's time to link up! 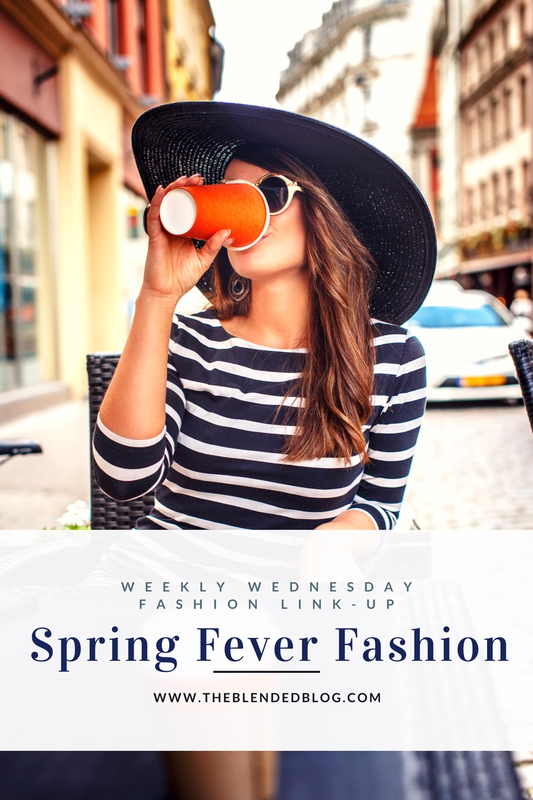 I hope you'll join us this week, and follow along with #theblendedblogstyle. I'll just be over here working on my ark. YES it was meant to be yours! Oh Lana I love everything about this whole look right down to your cute slip ons! Amazing bomber find on the most amazing lady! That bomber jacket is perfect for you! Love the colors! The colors are my favorite part! I am loving the bombers this season but of all that I've seen I think this one is exceptionally pretty! I love the bomber jacket, Lana! One of my BFFs wore one this past weekend to a book signing we attended. She told me she got hers from Stitch Fix and it was very similar to yours! I'm seeing them everywhere, especially the florals! That jacket is just the cutest on you! I have yet to jump on the bomber train, but if I found the perfect jacket like that I would have to reconsider my stance that I didn't need more jackets, hehe. A bomber would be perfect for your weather - light weight! Love your bomber!! So on trend! Love the jacket! We have glimpses of spring but so soggy!! Hopefully summer will be perfect. I agree - so soggy! When will the rain ever end? I'm hoping for a lovely summer too! We got a lot of rain in Northern California. We were in a horrible drought but not anymore and more rain is coming this weekend :( I love this floral bomber. I need it in my closet. I have family near San Francisco, and they haven't seen this much rain in years! I have generally never worn florals but then I got a pair of rose leggings and I'm in love. You rock this bomber! Florals would be beautiful on you! I've been on the fence about bomber jackers, but then the floral ones started coming out and I had to jump on that train! Yours is super cute! Thanks Laura. I love the floral ones too! Super cute!! I want one now!! If you can't have spring, you can wear spring, right? Great bomber. Love that it is so feminine. You wear it well. Great point - I will just wear Spring! Thank you, Leslie! I am so over the icky weather, too. And I have combatting the bad weather blues the same you are...shopping all the pretty Spring fashions! That bomber is adorable! What a great to add a little spring to your step. Thanks so much for linking up with me. The weather has to get better soon, right? Thanks for coming by!